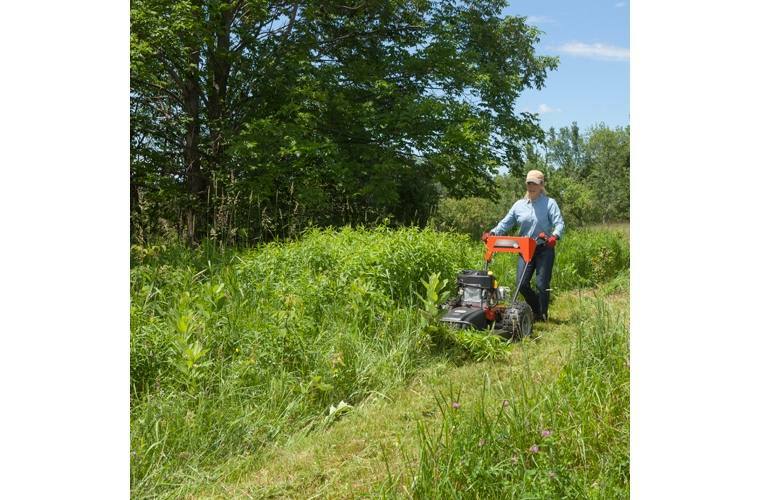 Lightweight but rugged, our PRO-26 has the power for cutting the thickest field grass and clearing brush and saplings up to 2" thick. Accepts all our optional attachments that make the DR a year-round workhorse! 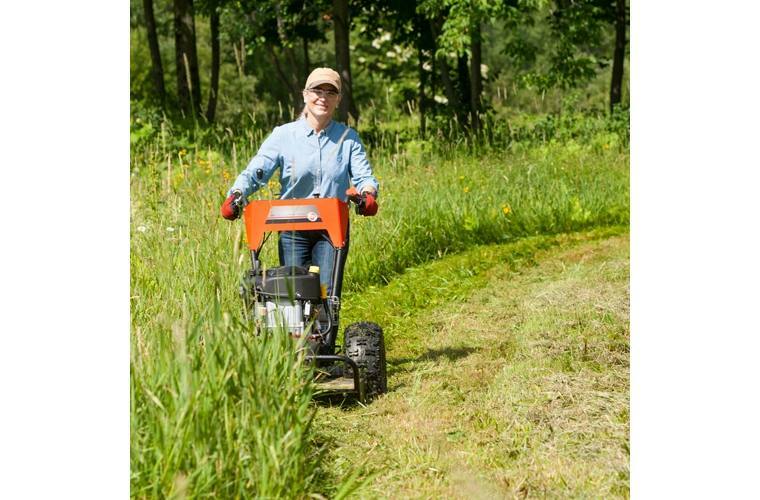 10.5 HP Briggs & Stratton PowerBuilt Engine: The legendary power, performance and durability of Briggs & Stratton® engines make them the obvious choice for our Walk-Behind Field and Brush Mowers. The PRO-26 10.5 HP model uses a durable 344 cc Overhead Valve PowerBuilt Series manual-starting Briggs engine with cast-iron cylinder sleeve. 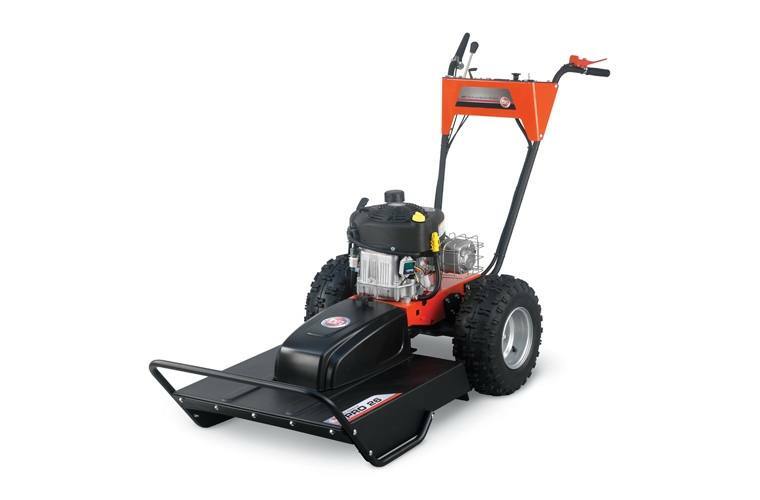 26" Pivoting Deck: The 26" deck is wide enough for effective clearing, but is still very maneuverable. 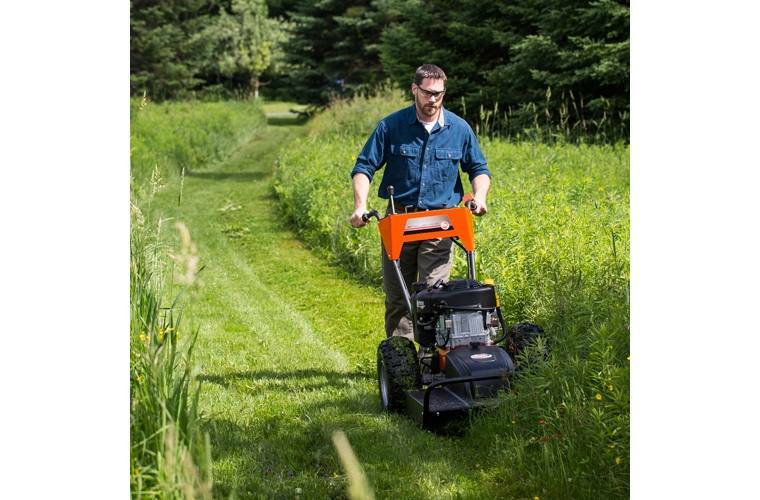 Unlike rigid, fixed decks found on some mowers, the DR deck pivots from side to side, allowing it to follow the contours of rough terrain. This feature minimizes scalping and improves traction. Big, Lugged Tires for Sure Traction: No other brush mower has tires like this. They're the biggest (18" x 6.5" x 8"), they have superior lugged treads that pull the mower through or over just about anything, and they are sealant filled...which means they're highly resistant to puncture. Tough as nails, apparently! Commercial Grade Electric Clutch: Our industry-leading, self-adjusting clutch is designed for easy access and quick swapping out of optional attachments. After 245 hours of testing we only used up 10% of the life of the clutch. There are no cables to stretch or idler pulleys to get out of adjustment. Built to Take a Beating: Field and brush mowing is a bruising business, and underbuilt mowers don't survive long out where the tough stuff grows. We frame our machines with heavy-duty, laser cut steel, and reinforce key stress spots so you get a product that will withstand years of use and abuse. 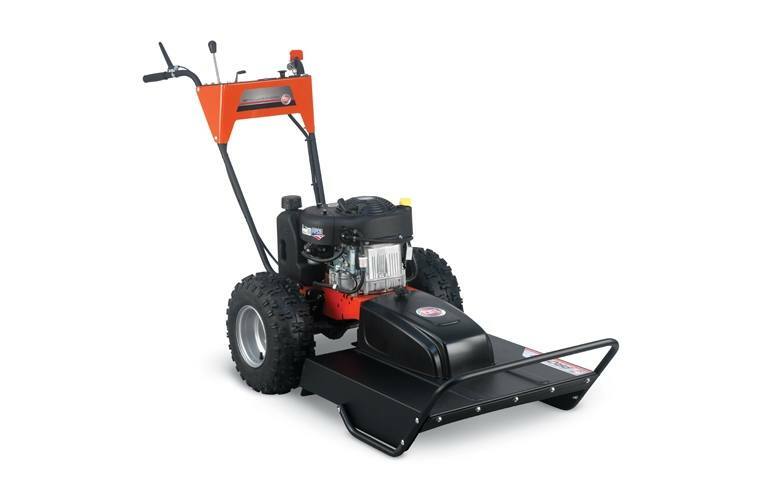 Attachments Add 4-Season Versatility: Thanks to our quick-change coupling system, the DR's brush mowing deck can be swapped—in just minutes—with one of our optional PTO attachments: a 42" finish mower, a 30" snow thrower, a wood chipper, or a 42" grader blade. It's like owning 5 machines in one! Handlebar Height: High: 42" Low: 38"
Dimensions: 18" X 6.5" X 8"